Shaikh Shafayat was born, in Trinidad, West Indies, where he attended College etc.. Due to his multi-faith and cultural upbringing, he was awarded a scholarship to become a Christian Minister. In 1975 he went to India to study Islam and became the first student from the Caribbean and North America to have enrolled in Darul Uloom Deoband, which is the largest and oldest Islamic Institute in India. In addition to graduating as a Qaari and Islamic Scholar, he also did a course in Journalism and established the Al Hikmat Muslim Magazine, plus he produced many television and radio programs in Trinidad and Florida USA. In 1983 he founded the National Muslim Sports League of Trinidad and Tobago, which established the Islamic Home for Children. He is the Founder/Principal of Darul Uloom Institute in Pembroke Pines Florida and the first Muslim to become President of the Interfaith Council of South Florida in the year 2002. He organized and conducted many Christian / Muslim / Jewish Dialogues in Churches, Synagogues and Islamic Centers in the U.S.A.. Shaikh Shafayat was the first Muslim to represent Islam at a Florida State Faith Summit, held at the Capitol Building with Gov. Jeb Bush in the year 2000. He is a recipient of the Silver Medallion Award from NCCJ (a national interfaith organization) and a recipient of the Peacemaker Award from St. Thomas University in Miami. For many years he lectured on Islam and terrorism to Pembroke Pines Police of South Florida and other Law Enforcement Officers. He lectures throughout the U.S.A. and worldwide on Islam, Interfaith Issues and Cultural Diversity. *Interfaith Activities and community services. *Lectured and visited many countries like- Makkah and Medinah, North America, Europe, South Africa, Pakistan, India, Bangladesh, Malaysia and the Caribbean - Cayman Islands, Jamaica, Barbados,Guyana, Venezuela etc. *Delivered sermons and lectures in many Islamic Centers, Synagogues and churches worldwide etc. *DIALOGUES-participated and conducted many CHRISTIAN / MUSLIM / JEWISH Dialogues, in Churches, Synagogues and Islamic Centers. * Lectures are broadcasted on ALHIKMAT TV with a LIVE broadcast of Friday Sermons from Darul Uloom Florida USA. *Served as THE ISLAMIC ADVISER / HEAD OF RELIGIOUS AFFAIRS/DEAN OF STUDIES for many Islamic Organizations. * TRAVEL REGULARLY WORLDWIDE DELIVERING LECTURES ON THE QUR'AAN - ISLAM, CULTURAL DIVERSITY and INTERFAITH ISSUES. *Ameer and Principal of Darul Uloom Islamic Institute in South Florida USA. *Former President of the Interfaith Council of Hollywood South Florida. *Former Director of SEAFERER’S HOUSE on Port Everglades South Florida. *Former Chairperson on the Ecumenical Service Council of Seaferer's House on Port Everglades. *Former Member of the BOARD for FOSTER CARE in South Florida. * Former Member of THE BROWARD MULTI TASK FORCE. *Former Member on the Advisory Board for the COORDINATING COUNCIL OF BROWARD COUNTY IN FLORIDA. *Former Director on the Board of NCCJ ( National Conference for Community & Justice). 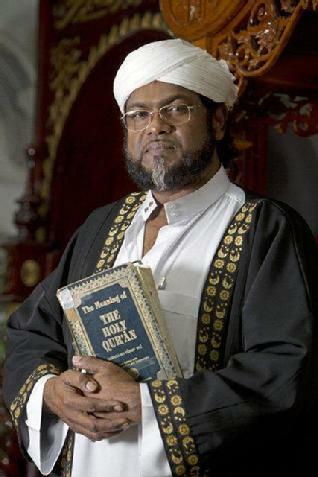 Founder and Editor of AlHikmat Monthly Islamic Publication for the past 30 years. 2007 - 2008 - An Honored member of THE HERITAGE REGISTRY OF WHO'S WHO. Available at the Library of Congress in Washington DC., as well as major libraries throughout North America.